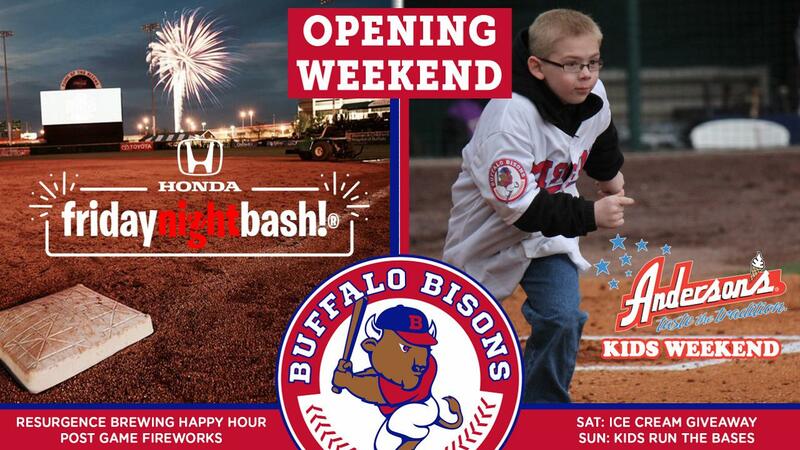 Bisons host first Honda fridaynightbash!, Anderson's Kids Weekend for first homestand of the season. Winter gave us a final little blast this past weekend, but that's all going to change this week at Sahlen Field. Because after the Bisons host the Scranton/Wilkes-Barre RailRiders on Opening Day Thursday, the forecast at the ballpark for the first weekend of the season includes warmer temperatures, lots of fun and even more exciting baseball action. The Bisons open up the season with seven straight home games at Sahlen Field, including the first Honda fridaynightbash! of the season with fireworks (April 5) and Anderson's Kids Weekend on April 6-7 that includes $9.00 tickets for all children aged 14 years old and younger. Check out all that we have in store to welcome back Bisons baseball, as well as Spring, to Western New York and Southern Ontario. Keep the weekend going an extra day!